← Poetry on the Move: It’s a Beaut!!! Join me if you can at the Martin Luther King Library this Wednesday, February 27, noon-1pm, as I talk about my experiences as the Second Poet Laureate, (2011-2013), and hope to make sense of contemporary poetry for the confused, contemptuous, or simply curious. I’m looking forward to it. As noted, it is most likely my last formal presentation in this role, though I will be participating in other poetry events through the end of March. I will be attending the County Board of Supervisors on April 9th for closing formalities. 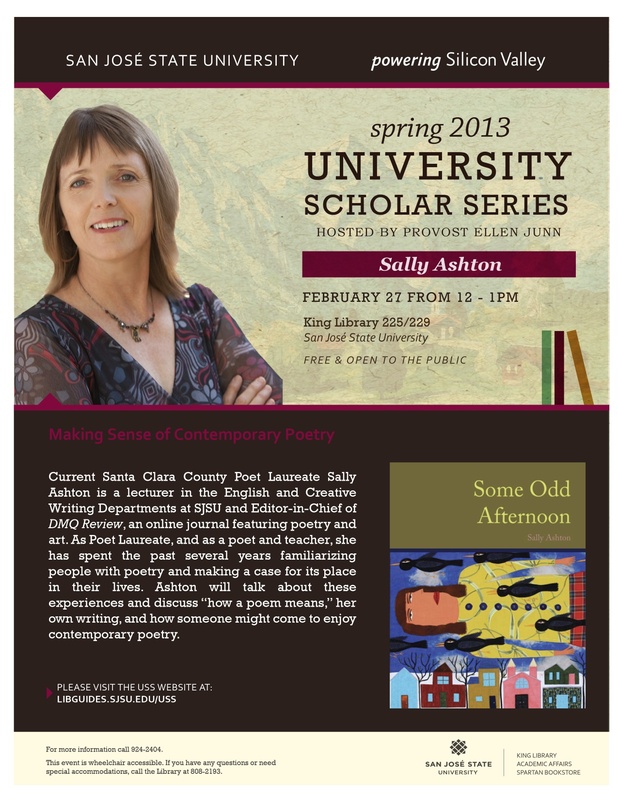 In April, it is more or less Sally Ashton all the time at the San Jose Museum of Art (just kidding), and I will post announcements here about the noontime lecture, morning workshop, and finally the annual Poetry Invitational. However, I will have lost my laurels by then and will be operating as strictly emerita (actually I think I lost my laurels when I was a teen. Oh, maybe that was something else). As you can see, I’m already starting to unravel. I hope to see you there. Check out other events at the Laureate Schedule link, above. Sorry to miss this – hope it was fun!